As the area’s leading wirefree specialist, we use only the most up to date equipment available. All Guardall Security intruder alarm systems are installed and maintained to current European Standards and inspected by the SSAIB. This process begins with a site survey and risk assessment, followed by a detailed quote. When instructed to install the alarm, our fully qualified and trained staff will fit the alarm with minimum of fuss to you, your family or your business. Upon completion there will be a full hand over of paperwork including certificates and instructions of how to us the system. 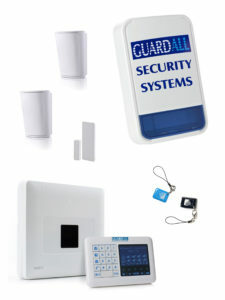 Guardall Security offer a 24 hr, 365 days a year emergency service should you require any assistance. Modern Wirefree alarm systems offer a new level of flexibility, modularity and reliability. It is clean and tidy to install, with less interruption, and more additional features available, ie. Should you change the layout of your premises additional devices can be installed within minutes, therefore allowing the system to be more cost effective. Guardall Security will guide you through the technical process of which intruder alarm system will be most suitable for your needs and at what grade level you or your insurance company has requested. 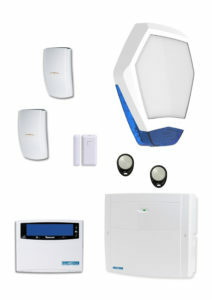 The PowerMaster family is Visonic’s cutting edge line of professional wireless intrusion alarm systems for residential, small business and light commercial premises. It includes multiple wireless control panels targeting different applications and an extensive array of wireless peripherals, providing an unmatched combination of reliability, performance and advanced feature set. Texecom’s new RICOCHET mesh networking wireless technology delivers more performance than any other wireless security system.